For the fourth year in a row, The Marine Mammal Center was awarded a $25,000 grant from the Disney Conservation Fund to support our work with the endangered Hawaiian monk seal. We are excited to announce that The Marine Mammal Center is a recent Disney Conservation Fund grant recipient, selected for our work to study wildlife, protect habitats and implement community conservation and education programs in Hawai‘i. 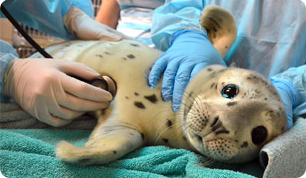 The Disney Conservation Fund provides support for our rescue and rehabilitation efforts to give sick, injured and orphaned Hawaiian monk seals a second chance at life. The grant will also support our ongoing scientific research and community education efforts, both of which are vital to the long-term conservation plan for this endangered species. Much of this work takes place at Ke Kai Ola (“The Healing Sea”), our hospital and education center in Kona, Hawai‘i. At Ke Kai Ola, we care for Hawaiian monk seals until they are healthy enough to return to the wild while providing a place where children and the community can gather to learn about the only seal species native to the Hawaiian Islands. In 2016, the Disney Conservation Fund launched a new initiative—Reverse the Decline, Increase the Time—aimed at reversing the decline of at-risk wildlife through scientific research and community engagement, and increasing the time kids spend in nature to inspire them to care for the planet. This initiative also carries forward the Disney Conservation Fund’s Annual Conservation Grants, a 20-year program aimed at supporting nonprofit organizations across the globe to reverse the decline of wildlife and engage communities in conservation. Since its inception in 1995, the Disney Conservation Fund has granted more than $65 million to projects that help protect the planet and animals in 115 countries around the world. The Disney Conservation Fund is committed to protecting the planet by collaborating with leading nonprofit organizations working to help threatened wildlife and inspire a lifelong love of nature in young people. Learn more about the Disney Conservation Fund and how it is helping to Reverse the Decline, Increase the Time by visiting Disney.com/conservation.